Unnecessary complexity in organizations often leads to waste. In the Lean Yellow Belt training, you become acquainted with the concept of ‘Lean’, a management philosophy that puts the customer first and wants to meet customer demand as efficiently as possible with the least possible waste. Wastes often frustrate an efficient way of working. With the help of Lean techniques, you learn to notice and eliminate these wastes. Anyone who participates as a team member in a Lean project or independently wants to apply the Lean philosophy and basic instruments in an improvement project. The main goal of the Lean Yellow Belt training is to create a broad basis within the organization for the continuous improvement process. The training is, therefore, most effective when it is given incompany and linked to an internal improvement program. You get the most return from the Lean Yellow Belt training if you also spend time reading the course material. The study load for this is approximately 10 hours. If you still have questions after that, you can contact your personal coach. 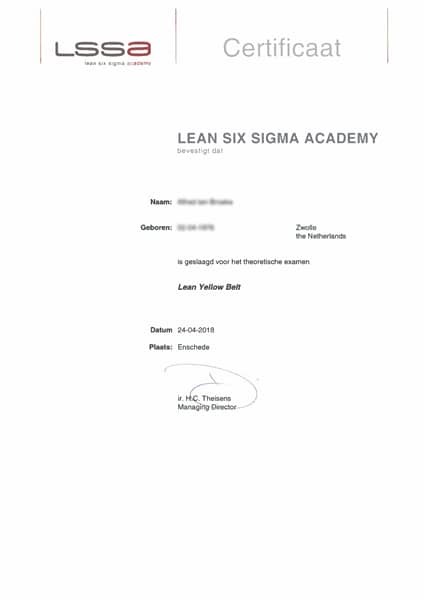 What is the content of the Lean Yellow Belt training? Through an interactive program, participants get insight into the basic concepts and techniques of Lean. We do this by letting them experience a Lean game themselves, which results when the Lean principles are used. When the eyes of the participants are finally opened, everyone is able to name what this means for their own work and work environment. This training is most effective when given in-company and linked to an internal improvement program. The in-company training also offers you the opportunity to make the training organization-specific and during the training, the translation is made directly between the theory and your own practice.